Qatar: The New Victim of “Regime Change” Agenda? Some recent development have shown in unequivocal terms that the Gulf crisis is far from a negotiated end; rather the geo-political fault-lines it has caused seem to have hardened into new regional configuration. That mutual negotiation wasn’t enough to settle the crisis between the two primary players, Qatar and Saudi Arabia, became evident during and after the recent telephone conversation leaders of Qatar and Saudi Arabia had. 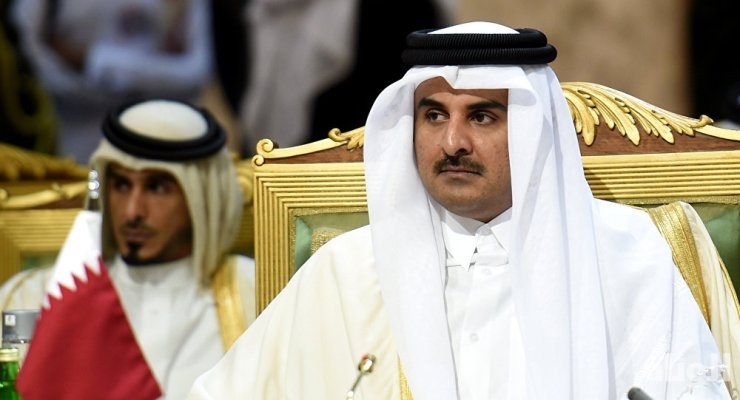 While Qatar’s emir expressed his willingness to engage in negotiations, the aftermath of the call and the Saudi reaction proved that the House of Saud wanted to prolong the conflict. This is pretty evident from the way Saudi Arabia announced that it was suspending any further talks with Qatar, and a chief adviser to the royal court in Riyadh accused Tamim and his father, Hamad Bin Khalifa, of spreading unrest and terror in the region, branding the latter as “Gaddafi of the Gulf”, needing to be surgically removed from power and replaced by a more amicable ruler. The question, therefore, is: will the “Gaddafi of the Gulf” meet the same fate as the “Gaddafi of Libya”? While we shall find it out sooner than later, what is clearly on the surface is that Qatar is on Saudia’s list of “regime change” agenda. And, preparations for it are already underway. The September 14 conference, which is aimed at “bringing democracy” to Qatar, organized by Qatar opposition in London is an expressed and overt formation of “regime change.” Ironically speaking, the conference’s host is a British Conservative MP Daniel Kawczynski, who is a strong ally of Saudi Arabia—a country where democracy is not only considered ‘un-Islamic’, but even repulsive. The organizer of this conference is Khalid al-Hail, a former associate for Hamid bin Jassim, the ex-prime minister of Qatar. The purpose of this conference is to increase pressure on Qatar and to make it submit to the opposition’s demands. At least this is what the Saudi owned, Al-Arabiya’s assessment is. Khalid Al Hail, who sees the crisis over Qatar’s supposed support for terrorism and promotion of extremism as an opportunity to return the country, is accordingly playing his part in Saudia’s plot to bring “reformation” to Qatar i.e., de-throne the current leadership and replace it with someone who would owe his rule and his existence as a ruler to the pleasure of the House of Saud. Information available on the conference’s website clearly states that global support is essential for bringing ‘change’ in Qatar. This is particularly the case as the presence of Turkish troops on Qatari soil is a key deterrent for any combined military action of the Qatar opposition to remove the current Emir. Therefore, the aim of the conference seems to be building international consensus around the idea of a new Emir in Doha. Who could the new Emir then be? It seems that the Saudis have already made a choice. The first glimpse of the ruler-in-the-waiting was reported when Saudi Arabia’s King Salman hosted Abdullah Bin Ali Al Than, a largely unknown and rather mysteriously appearing Qatari royal, in the middle of August in his summer residence in Morocco. The meeting wasn’t important, but it was highly symbolic in terms of the kind of audience the little known royal was given and the reward he received in terms of ‘succeeding’ in terms of re-opening the Saudi border for Qatari pilgrimages for Hajj. The move, as is evident, is clearly aimed at elevating Abdullah’s status in Qatar and to cultivate him as ‘hand of the Saudi king’. The Saudi channel al-Arabiya wrote, in the same vain, that Abdullah’s ancestors are well known “for their good governance and administration of the country”—hence, suitable for the future of the country as a possible replacement for the current emir, who has been persistent, much to the disappointment of the Saudis, in refusing to yield. While Abdullah, who is married to a Saudi and spends a lot of time in the kingdom, is basically a London-based businessman with commercial interests in the Gulf and lacks public support that would help propel him to power, his emergence, nonetheless, serves as a way of telling Qatari leaders and global powers that the crisis is far from over, and that the possibility of triggering internal crisis in Qatar is very much on the table. Given the fact that an armed intervention of the kind Saudi Arabia made in Yemen, its other neighbour, seems not possible because of the involvement of Turkey in the crisis, there is nothing on the ground that seems to prevent the Saudis from working out an internal uprising in Qatar and then use Abdullah, whose grandfather and father ruled Qatar from 1913 to 1960, as the new Emir. What, as such, has been termed as a policy of “royal sheikh-up” seems to the staging ground for a much bigger crisis in the Gulf than we have so far seen since this June, when Saudia Arabia and its principal allies in the region started Qatari boycott. Qatar has so far been successful in defying Saudia’s hegemonic impulses. And, from the Saudi perspective, if this defiance continues in the same manner, Saudi Arabia will end up facing yet another defeat after Yemen and Syria–hence, the initiation of “regime change” policy. The key question, however, is: how will the Saudis convince the US, which has recently sold weapons worth billions of dollars to Qatar, to agree to a “regime change”? As far as the US position is concerned, it might agree as long as this change doesn’t disrupt its own interests in the region, for a passive and submissive Qatari emir will not be problem either for Saudi Arabia or the US. Plus the latter would still be able to earn billions by selling weapons and jets. Let’s, therefore, embrace for yet another “regime change” impact!